Middle of Winter, and who does think about dishes that would refresh you and help you to cool down? Pregnant and living in CA where in January we have ripening tomatoes and growing lettuce outside our apartment. “Chłodnik” literally means “cooler” and in Poland and many European countries is eaten during the Summer and late Fall when fresh veggies are very easy to get. If you have the access to fresh veggies all year long there is no reason to not to make it. It’s delicious, easy to make and good for breakfast, lunch, dinner (or 2am sinless snack – in my case). The base for it is always plain yoghurt, kefir or buttermilk. 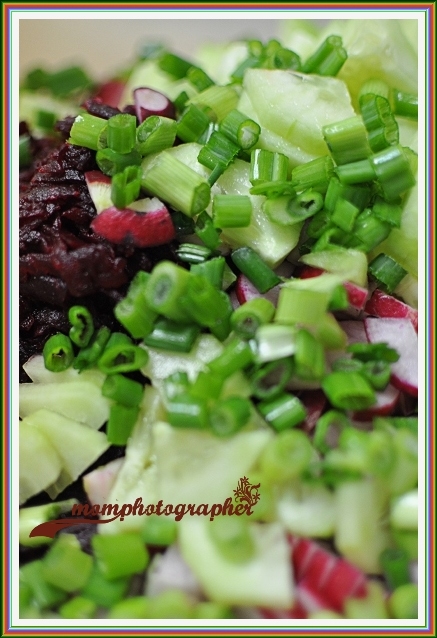 In the recipes I know of and have eaten in the past the main ingredients were: beets, cucumber, radish, chives, dill. and chill in the fridge at least for an hour. The recipe makes a very thick consistency soup. 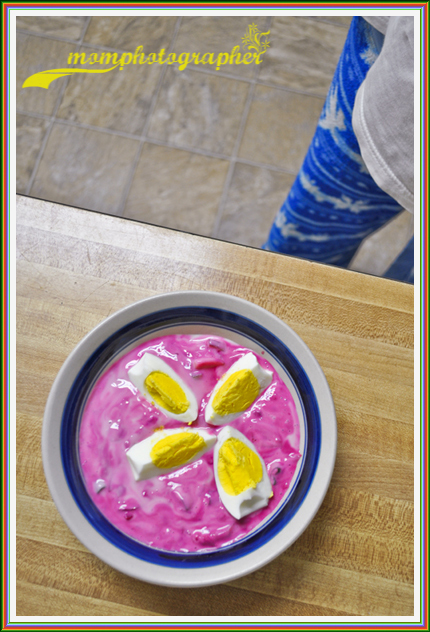 If you think you might not like it skip the yoghurt and use only kefir instead. Boil and grate the beet. Put it asaid until is cold. 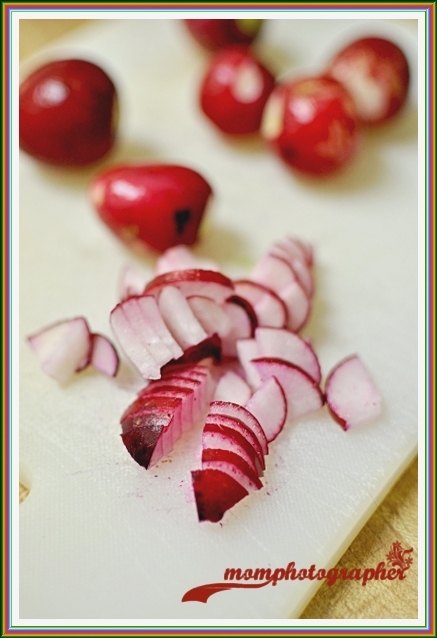 In the meantime cut radishes, cucumber and chives into small pieces (not too small, though). Mix it all together in a big bowl. Add 2 cups of kefir and 1 cup of yoghurt. Mix it all together. Add salt and pepper. Taste. 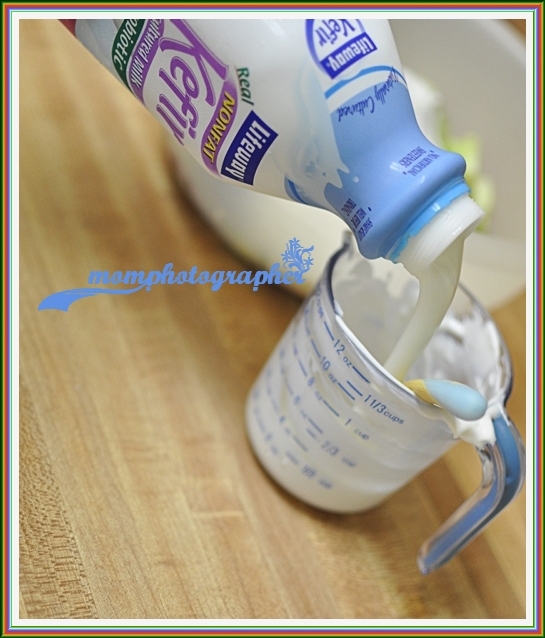 If the consistency is to thick add more kefir. If it isn’t salty enough you might want to wait to add more after is chilled and ready to serve. Chill in the fridge for an hour at least. 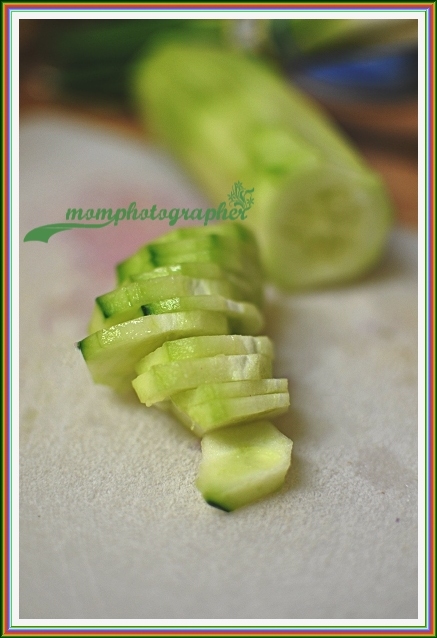 Serve with hard boiled egg cut into quarters. Sprinkle with chopped dill. I didn’t have it so I skipped that part. I am not the biggest fan of dill, anyway. My husband said it would work perfect as a chip dip (?). I would’ve never thought about that but after he said it… I kind of agreed. btw, Polish kefir it totally different from the one I found here so the soup is not exactly the way I am used to it, but it’s still delicious. thank you 🙂 it’s definitely worth a try if you haven’t tried it before! Kocham Chlodnik 🙂 I make mine with Kefir or Buttermilk. I can’t wait until it’s warm enough here to make again (it hit 21 today, 18 tomorrow). Enjoy and enjoy the warm weather. Not long now till baby comes for you! Sciskam! I need to ask my sister to email me a few chlodnik recipes. She’s got an entire book for that. She always makes such an amazing and delicious soups… now I’m in a chlodnik mood (and barszcz, of course)! Prettiest soup I’ve ever seen! You know they say the more colorful, the more vitamens. That baby is loving you! but you’re right with those vitamines.this soup is just filled with it.almost nothing is cooked to death (just those beets) and the rest is fresh and filled with all the goods like it just came from the ground.loving it! Your photography is beautiful. This is my first time to your blog and I love it. So pretty! Thank you for linking up at Weekend Potluck. I pinned this. thank you for visiting, and thank you for such a great comment! thank you for pinning, as well! Your soup is lovely and sounds delicious. As usual, your photos are amazing! Thank you for sharing this recipe with the Hearth and Soul Hop.